With the Miami skyline as a backdrop, Thorhaug in April plants seagrasses in Biscayne Bay. 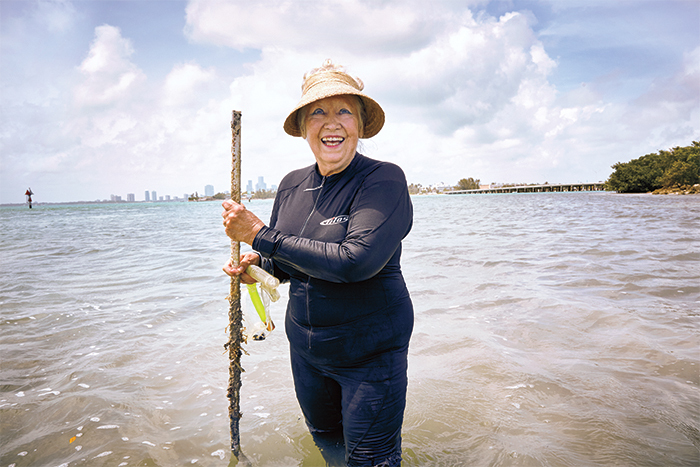 For nearly five decades, Anitra Thorhaug ’62 has been restoring coastal ecosystems all over the world. Dubbed the “seagrass lady” by colleagues at the United Nations Environmental Programme, Thorhaug has left her mark on five continents—a mark so significant it can be seen from space. “When we successfully restore a seagrass habitat, satellite photography shows dark patches where previously the water appeared barren,” Thorhaug explains. 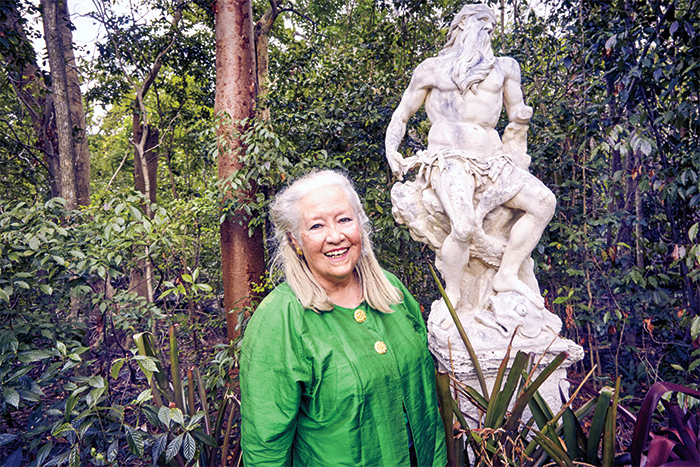 From her home in Miami—where she swims daily, oversees the Greater Caribbean Energy and Environment Foundation Inc. (GCEEF.org), plans trips around the world and organizes research projects for her appointment at the Yale School of Forestry and Environmental Studies—Thorhaug spoke with us about seagrasses, ecology, women in science, a life of independence and all the work that lies ahead. Seagrasses evolved from terrestrial higher plants (which themselves evolved from sea plants). Like land plants, seagrasses have roots and flowers and seeds, and they get energy from photosynthesis. When they returned to the seas, they had to adapt this biology to harsh conditions, including low and unpredictable light levels and very salty water. Yet they managed to thrive. Today, more than 70 species are integral parts of ecosystems all over the globe. Seagrasses occupy 171,000 square kilometers of Earth. But coastal development, agricultural practices and other human decisions have taken their toll. Already, we’ve lost 51,000 square kilometers of seagrass meadows, and they’re disappearing at a rate of 7 percent a year. I developed a model to restore seagrass ecosystems. I collect seeds or sprigs from healthy meadows, transplant them by hand to damaged coastal zones and monitor them on the ground and via satellite technology. I do much of the work myself, working side by side with locals whom I personally choose—often artisanal fishermen, local scientists or other community members. Doing it right requires great water skills, careful monitoring and laborious handwork. But it’s worth it. Seagrasses can restore entire ecosystems, providing food for threatened and endangered species like whooping cranes, sea turtles and manatees. When I attended Smith, most women my age were hunkering down into the paradise of home and children. But I didn’t come from women who did that. Even my great-grandmothers worked: One was a physician, and the other ran apartment buildings. I thought maybe I’d be a physician, but there were really only a few specialties available to women: psychiatrist, pediatrician or OB-GYN. I love swimming and diving, so I chose oceanography instead. I finished my bachelor’s at the University of Miami, one of two places that offered a major in ocean studies. I began my career studying how molecules move across a single cell membrane. That was deeply pleasing from an intellectual standpoint—the equations were beautiful, and I worked within a defined, contained system, whose conditions I could control. For my Ph.D. thesis, I’d studied the effect of temperature on the process. Around that time, they were holding hearings on the effects of the Turkey Point nuclear power plant on Florida’s Biscayne Bay. A federal judge ordered that my Ph.D. thesis, about temperature effects, be submitted to the courts. The judge read my paper about thermal effluents and said, “Young lady, you’ve shown that the seagrasses have died. Can you bring them back?” I had no idea, but I told him I’d try. It hasn’t been easy to be a woman in the sciences. When I was pursuing my doctorate, for example, there was a Ph.D. requirement that candidates spend six weeks on a ship. But no one would let me on their ship! So I started studying coastal plants. Then in 1972, after the U.N. Conference on the Human Environment in Stockholm, it became urgent to understand coastal zones. Suddenly deep-water oceanography wasn’t the only game in town, and I was on the forefront of something new. I’ve worked in institutions where I was surrounded by misogynists; I could have wasted a great deal of energy and time proving that they were wrong, striving to move upward within their ranks. But my reward would have been to remain surrounded by prejudiced men, assuming some organization’s goals as my own. I wanted to stay independent, to ask my own questions and figure out for myself how to answer them. So I became a free agent. This meant piecing together funding from grants, international agencies and for-profit groups struggling with marine problems. There was opportunity in that. Somewhere along the way, I moved up and over those men. I’ve worked almost everywhere a person can work—South America, Asia, east and west Africa. I helped restore the environments of the Arabian Gulf after the Gulf War oil spill; I’ve restored sites in Jamaica and the Philippines that were so polluted that many refused to enter the water. I got a pilot’s license, and I flew my own Mooney airplane all over the Caribbean basin. I’ve spent my life surrounded and supported by brilliant people—from Aharon Katzir Katchalsky, an Israeli biophysics pioneer assassinated in 1972, to the incredible feminist Elizabeth Dodson Gray ’51 and my late husband, Andrew Oerke, a poet who was also a microenterprise genius and helped found the U.S. Peace Corps. Ali Benjamin is a frequent contributor to the SAQ.